One week into the CotD website, and already some people have joined us on our quest to develop the game of the century. One thing we learned from our previous games, is that we received very important information and feedback from the gamers, but at a very late stage of the development cycle. Basically because there was no way for the gamers to connect with us or the project during the development. This is definitely something we needed to change for CotD, and so we came up with Triangle Connect. What it actually does, is connect all of Triangle’s future projects under one account. That’s right, sign up once — use forever. You can read more about Triangle Connect in the corresponding Article, but in this case, I wanted to explain how you will be rewarded for your contributions in the community. The first thing you’ll notice when you post on our boards, is another picture, next to your avatar. This shield or Coat of Arms represents your current rank in the community. There are 10 ranks in total, ranging from Outcast to Hero. 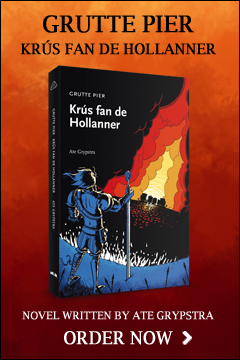 It follows in rough lines the progress our hero Grutte Pier went through in his life. As you can see in the chart on the right. Besides the ranks there are four different support levels. 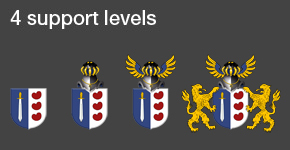 Each support level add’s extra achievements to your Coat of Arms. We won’t go into details right now, about how you can earn these achievements. But we certainly will inform you when these come available. We think they are pretty cool and you can earn them even if you are still an outcast. So in other words they are rank independent. And of course there is a special developer rank. Which is an easy way to identify the developers on the site. I wonder when we would first start seeing those pompeblêden ones on the forum?